Glass refractor wallpack with vertical lamp performance. Energy-saving LED and HID systems up to 400w.. Sources include metal halide, HPS and pulse start. Units provide wide lateral coverage with non-cutoff distribution. Cast aluminum door with borosilicate glass refractor. Bottom hinge allows door removal. Twin HubbellGard® screw closure for positive seal. 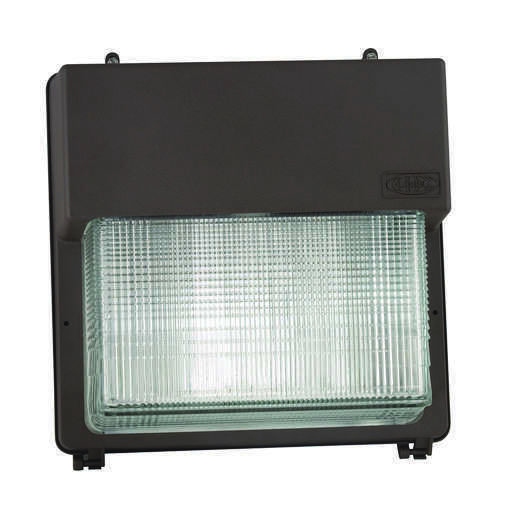 Cast aluminum back housing provides firm mounting and heat dissipation. Mounts over recessed wiring boxes. Has two ½" conduit hubs for feed-thru wiring. Specular, anodized aluminum reflector panels for vertical lamp provide high performance. Typical spacing is 4-6 times mounting height. PGM3 has medium base socket to 150w. 250w units are mogul base. Top 1/2" hub can be used for field installation of PBT button photocontrols or conduit wiring from above. Socket is porcelain mogul base with spring-loaded center contact. Bronze powder paint finish is standard, other finishes available, consult factory. Wire guards and polycarbonate shield accessories are available for refractor protection.